This entry was posted in Little Free Library and tagged Book Boxes, community, community libraries, Donna Pierre, Little Free Library, Little Free Library of Distinction, Todd Bol. Bookmark the permalink. Thank you, Kate! It’s hard to describe the thrill every time someone stops by and opens the library doors. I saw a woman sitting on the knee wall reading to two young children last week. Others stop by to bring books, or tidy the arrangement. It’s beloved by children and adults. And justly so. Long may it and you prosper! Thank you, Sara! Donna is an amazing talent (like you). The library spreads joy every day. Thank you, Michele. I too loved the “reading to the boys” years. Having a Little Free Library at the edge of our sidewalk is enriching in a hundred different ways. This is wonderful news, and richly deserved. Well of course it did! Who could be surprised by such acknowledgement 🙂 Well done everyone – your library looks just lovely Alys! I love that users tidy it up too – isn’t that special!! Pauline, it is special. One of these days I’ll share some of the comments in the guest book as well. Who would have thought that an artist named Pauline King would donate handcrafted bookmarks from the other side of the world. That is special too! Congratulations Alys 😀 this is so cool. Thank you, Joe! I’m delighted. Thank you, Marlene! I’m continually amazed at Donna’s skills. She’s done faux painting for a couple of my organizing clients, and she designed the entire office of Roger Kittle, the massage therapist that introduced us. Mike is a handy guy, and enjoys using his tools whenever possible. I spray painted the shiny hooks with some leftover copper spray paint so that they would look more natural, then covered the old holes with gemstones from my scrapooking stash. It’s been so much fun. Donna also made the back as beautiful as the front, so every time I walk into this room I can see and enjoy it, too. I’ve loved reading my entire life. I can’t imagine a world without it. 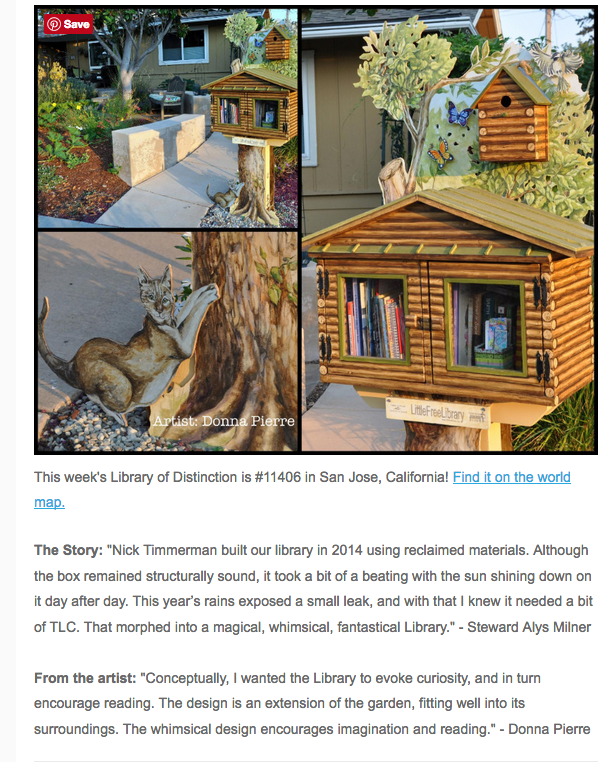 I love the little libraries! My friend in Sebastapol has them in her neighborhood as well. Congratulations on the recognition. Thank you, Mrs. P. I used to work summers in Santa Rosa, not that far from Sebastapol. Do you live in that area too? It’s lovely. No, I live in Florida now but have visited last year. I grew up in the bay area and lived there for almost 50 years. Sebastapol is my ideal living environment, but the cost of living in California is just insane. Yay Alys!!! Fantastic! Your renovated library is wonderful. Donna has created something unique, and the cat at the bottom is ‘purrfect’! I also like that you are a ‘steward’ pf your library, showing that the library is there for everyone to enjoy. Thank you, Anne! You’ve been a great supporter of the library from the start. It’s wonderful the way the books flow now, three years in. They are always changing. Small fliers appear, too, from our local main library advertising book sales or events. It’s a great way to connect all libraries. Oh, Alys!!!! Of course your sweet library was recognized. Your love of reading and your care and concern for your neighbors shines brightly every time the little door is opened. Thank you so much, ME. I love that what you’ve said: “Every time the door is opened.” Reading takes us to exciting places, in our minds and hearts. How can you beat that? Do you and Robert still visit one in your neighborhood? Congratulations, Alys. I’ve never seen a LFL here in Britain, although we do have them informally inside buildings (e.g. a section of our staff kitchen at work). Anyway, your LFL must add to your community in beauty as well as service 😊. Thank you, Helen. It’s nice to hear that you have a book collection where you work. I remembering traveling years ago, and finding a shelf of books available for the taking. I read one of my first John Irving books that summer (The Hotel New Hampshire). Sharing books makes so much sense, in whatever way it can be done. I use my local library a lot these days and my mum and I swap books whenever we’ve bought one. I’m trying to remember if I have ever read anything by John Irving. Congratulations, Alys – that is exciting! What a wonderful recognition for your hard work. Thank you, Karen. We’re all pretty darn tickled about it. Donna’s vision is extraordinary. How wonderful Alys!! It certainly is beautiful. Thank you, Pat. That is lovely of you to say. In addition to the beauty of the library, I love the way it compliments the surrounding garden. 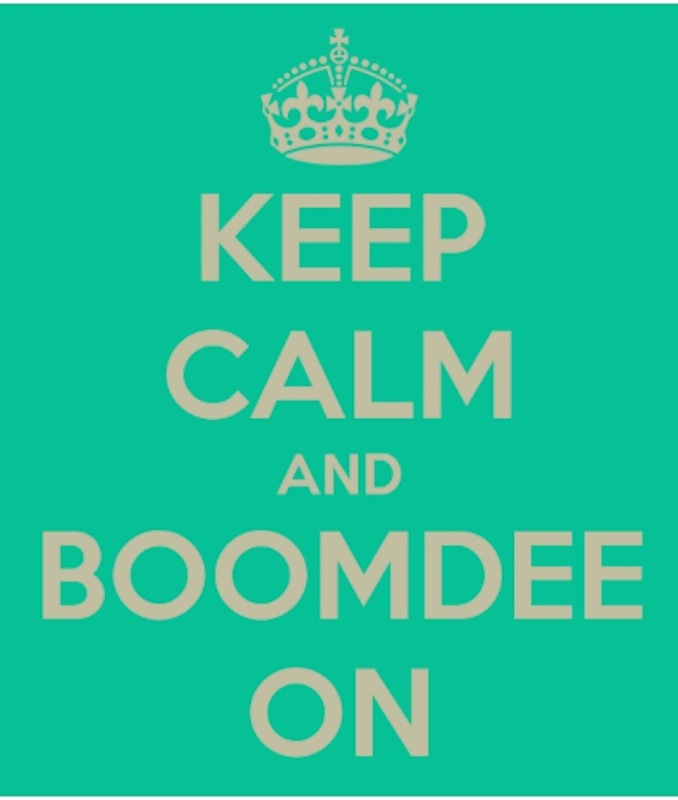 And if it attracts more readers, all the better. So fantastic! A huge congratulations! Thank you, Sheryl! The wonderful response has been terrific. It’s fun seeing the different books that pass through as well as the turnover. It’s a sign of multiple users. That makes me happy. Congratulations indeed. What a wonderful idea, making a nice home for the library and for the books to seem loved. I hope this catches on all over the world. Hello there and thank you. Part of what excites me the most about this movement, is the effort to get small libraries into communities that really need them. They have initiatives in the US that I hope will spread to other countries. 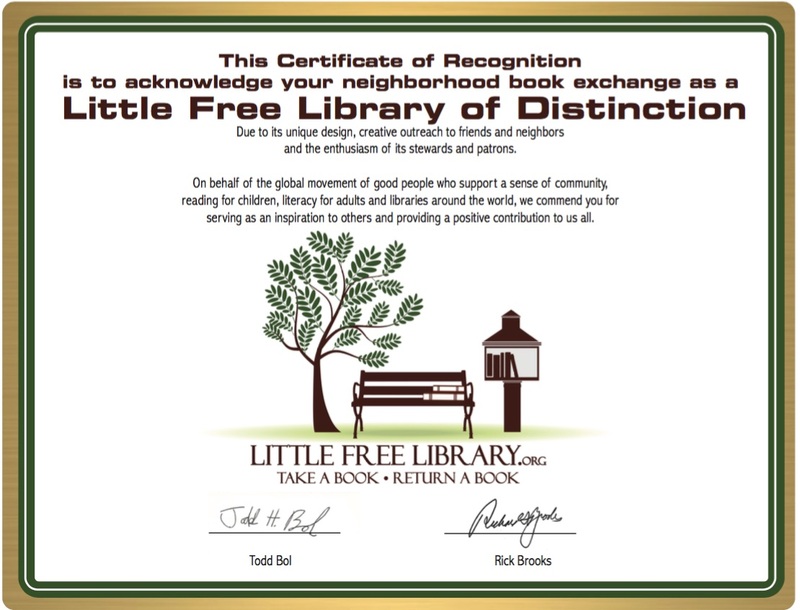 That said, 50,000 Little Free Libraries around the world is amazing. You must be over the moon…it is absolutely wonderful…many many congratulations and I hope one day that I can have a trip over there to see it! I would love it if you could pop over for a visit! And yes, over the moon is a good way to describe how I feel. This LFL is a thing of joy. SO awesomely cool! And SO deserved! Your efforts to make this a special little place have been amazing and I’m really glad they’re being recognized, Alys! Thank you, Cathy. The cat was part of the original design, but Donna wanted to engineer a way to attach it so that it seemed more three dimensional. Does that make sense? Anyway,she attached it to a small section of wood which is wedged between the original two supports. I love it. So well deserved – well done! It’s lovely to hear that others are getting so much enjoyment from the service. Wow 😊 Who knew when you started this how important it would become to everyone involved, including your daily visitors. Even without knowing what it is, it adds to the beauty of your front yard! I love it. Kudos to Donna. Thank you, Sharon. It’s really been an experience for sure. In addition to having this beautiful library, I’ve met a few stewards of other local libraries and I’ve connected with one via Facebook, the lovely Carrie Marie. It really is a movement, and a wonderful, peaceful, inclusive one at that. LOL I love that zucchini story. That made me laugh. People leave small treasures in there, some appropriate, some not so much. I took out an order form yesterday for some magazine and put it in the recycle bin. Mostly, it’s books, bookmarks and a few small toys now and again. I love the Canadian way. Oh hello! I was just at your wonderful blog. Thanks for stopping by. Donna Pierre is amazing.